Enjoy FREE Flights and Transfers* when you book from a tempting selection of exotic fly-cruise holidays to Indian Ocean islands, the Caribbean or India – the most exciting and rewarding way to discover the best of these iconic, far-flung destinations. 2 for 1 Mini Cruises are back! Our biggest mini cruise offer 2 for 1 is back! This offer is extremely popular! The offer is available to book up until 5th November and travel dates run up until 28th of December. We know that, for many of you, a summer holiday is the highlight of the year; an escape from the stress and strain of daily life, or simply the chance to enjoy some spectacular sunshine and scenery in some of the most beautiful and sought-after destinations on earth. With this is mind, we’ve created a fantastic summer cruise programme packed with a wide choice of sailings, making the most of our fleet of smaller, more intimate ships to bring an abundance of unforgettable sights and experiences closer to you. There are cruises from 7 local UK ports – departing from May to September 2016 – and a smorgasbord of destinations to choose from, so we’re sure you’ll find the perfect summer break. You could discover historic and attraction-packed cities in France and Spain; cruise Germany’s incredible Kiel Canal and beautiful Weser and Elbe Rivers; immerse yourself in the outstanding natural beauty of Canada or the Norwegian fjords; soak up the Canaries’ soothing sunshine; explore the breathtaking islands of the Adriatic with a call to enchanting Venice thrown in for good measure and much more. There’s even an incredible circumnavigation of the home isles, taking in some of Britain and Ireland’s most iconic historic sites and scenic delights. And, as usual, you’ll find there’s ample room to relax and enjoy your holiday on board, cruising with hundreds – not thousands – of like-minded guests, and enjoy a high level of personal, attentive service from our friendly staff no matter which of these expertly crafted cruises you choose. Plus, with great value fares on offer and almost everything included in the price, you can book with confidence knowing you’re getting a fantastic deal. The sparkle of the light on your wine glass; the perfectly seasoned meal you won’t forget; the personal greeting from your stateroom steward. Just like you, Cunard know that luxury’s all about making time for you to savour new experiences, in impeccable style. That’s why you don’t have to imagine a cruise with the highest standards of service, iconic journeys and amazing entertainment, you can experience it for yourself aboard Queen Elizabeth, Queen Victoria or Queen Mary 2. Cunard believe great service is warm and sincere, never stuffy or pretend. Always friendly, yet never over-familiar. There for you when you call, otherwise almost imperceptible. At Cunard, we call it White Star Service because it's a shining example of how best to treat every guest. 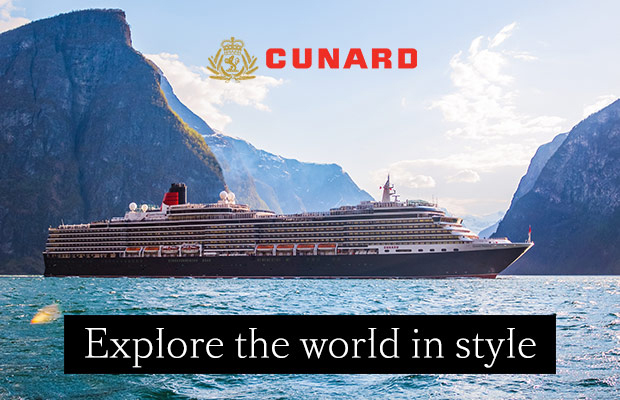 The Cunard Fare offers you flexibility, 15% deposit, prioritised choice of dining and stateroom and additional benefits, including complimentary on board spending money. Whatever you like to dine on, you’ll find it on Cunard’s menus. Healthy, hearty, light or haute cuisine, everything’s delicious and there’s an array of places to eat. You can even sample local flavours while you’re at sea as Cunard’s chefs like to source fresh ingredients, wherever you are in the world. Grill Suites are the epitome of luxury at sea. With bespoke dining, personalised service (including your own butler in Queens Grill suites) and an exclusive lounge and terrace, everything’s designed around you. It’s the kind of experience you’ve been dreaming of. Are you ready to do something different? 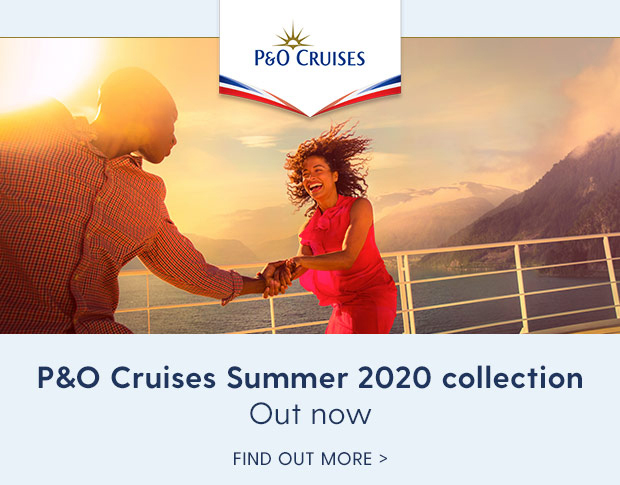 Summer 2020 could see you kayaking in one of the most peaceful places on Earth, exploring cosmopolitan Bergen surrounded by soaring mountains, and getting to the heart of Viking history in Stavanger, as you cruise the Norwegian fjords aboard P&O Cruises beautiful new ship. Iona will deliver a season of 7 night Norwegian Fjords cruises, offering spectacular scenic cruising opportunities of five fjords. The programme includes calls to Stavanger, Olden, Geiranger and Bergen, as well as two calls to Ålesund. Between May and October 2020, Britannia will be operating a dedicated summer season of Western Mediterranean cruises, focusing on the very best the region has to offer. In the peak summer period, delivering three cruises with an itinerary designed towards relaxation, offering beach destinations and places that families can enjoy together. Other exciting itineraries include Azura's alternating 14-night Mediterranean and Baltic cruises. Ventura delivers relaxation and sunshine on a 12-night Atlantic Island adventure or choose from a 7-night Iberia and 2-night short break cruise with Arcadia operating a 30-night Canada and North America holiday. Discover the traditions, cultures and cuisine of Quito on our free Ecuador tour, as part of this fascinating cruise. Explore Boston, watch live jazz in Montreal and join a free guided city tour of Toronto on this autumnal cruise. Sail to Sorrento, Amalfi and Rome on one of the world's largest tall ships, and we'll include a free tour of ancient Rome. Get ready to pack your bags and sail with a last minute cruise deal. With a vast array of exciting sailings, be sure to hurry and have your pick of the best offers available. All cruises depart within eight weeks, and with a wide range of UK regional departure ports, you could be soaking up the relaxing on board atmosphere sooner than you think. Our last minute cruises provide a great way to experience life on board, and offer the opportunity to explore some amazing world-wide destinations. If the thought of year-round sunshine, sandy beaches and spectacular natural scenery with just a short flight appeals to you, then a Canary Islands fly cruise could be just the tonic you need. The islands have much to explore, from the lava fields of Lanzarote, to the exciting city of Dakar in West Africa, meaning that our fly cruises can take you to further destinations faster. The atmosphere on board our cruise ships will ensure you really have the opportunity to relax and with these diverse cruise holiday options, you will be planning your next one before you leave! On a world cruise, you can sail to exotic, far-flung destinations, explore new cities and meet new people at your own pace. Enjoy a full epic journey, cruising around the world, or choose to join and leave our world cruises at ports along the way, seeing only the parts of the world that you want to explore. Imagine seeing the Statue of Christ in all its glory as you arrive into Rio de Janeiro, or wake up in cosmopolitan Singapore. Then bathe in the calm blue waters of Phuket, before marvelling at the opulence of Dubai. Experiences that will stay with you forever.